LIMA, Peru (CNS) — Half-hidden behind palm trees at the end of a once elegant avenue in a now rundown neighborhood, the Convento de los Descalzos — the Convent of the Barefoot Friars — has witnessed half a millennium of Peruvian history. With about 500 artworks hanging throughout its seven cloisters and tucked away in storerooms, the building that once housed Franciscan missionaries offers “a journey through three centuries of religious art, all in one place,” Alvarez said. During colonial times, Spanish clergy used paintings and statues of religious figures and scenes for evangelization. The convent’s 16th-, 17th- and 18th-century art represent styles known as the Cuzco, Lima and Quito schools, which reflect the melding of European and indigenous artistic styles. Built at the foot of St. Christopher’s Hill, a Lima landmark that provides a panoramic view of the city, the convent itself is a work of art. Founded in the late 1500s by Franciscan friars who sought to live more simply — and whose practice of going without shoes or wearing only sandals gave the Convent of Saint Mary of the Angels its popular name — the place became a museum in the 1980s. Graceful arched porticos around the convent’s seven cloisters provide a refuge from the loud rush-hour traffic outside. But some pillars cracked in recent earthquakes, electrical wiring is exposed to the elements, and saints, angels and early Franciscan missionaries stare down from the walls through layers of mold and grime. “The museum has many needs,” said Alvarez, a native of Spain who first traveled to Lima to volunteer in Franciscan mission work and now heads the fledgling museum foundation. 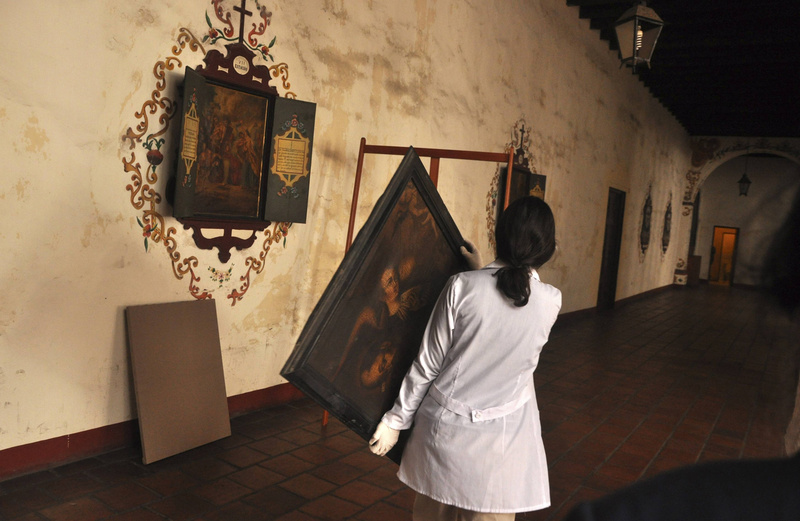 Protecting and restoring the artwork is a priority, but restoration experts are in short supply in Peru, she said. The few who do graduate from National University of San Marcos or Lima’s Fine Arts School are snapped up by art museums or better-funded organizations. As a first step, Alvarez organized a seminar on colonial art restoration in May, inviting Pilar Sedano, director general of cultural heritage for the city of Madrid and former head of restoration and conservation at the Museo Nacional del Prado, Spain’s national art museum. The seminar drew more than 100 participants, including many students from towns in the interior of the country. “Everyone asked if they could sign up for the next one,” said Alvarez, who hopes future events can include more hands-on training. She estimates that it would cost about $200,000 to establish a workshop in the convent where half a dozen professional art restorers could work on a rotating basis with six art school graduates on fellowships. That amount is currently beyond the museum’s reach, but the seminar gave Alvarez and her colleagues a chance to test restoration techniques on a painting from the convent’s collection. The surface was so dark that details were unclear, and Alvarez thought it was probably a painting of St. Francis of Assisi. But an X-ray image — made with a machine borrowed from the parish clinic next door — revealed the head of a violin beneath the saint’s left arm, a symbol associated with the Franciscan missionary St. Francis Solano. As they began to clean and restore the painting, the violin scroll and other details came into view. “It’s exciting when you start to work and people appear on the canvas,” Alvarez said. Although it is now in the middle of Peru’s sprawling capital, the convent originally was outside the city, surrounded by fields and vineyards. Behind the refectory, where the walls are lined with images of saints and early Franciscan missionaries, a wine cellar still holds huge wooden barrels for aging wine. Up a flight of stairs, apothecary jars and equipment from the 19th century are on display in a room in an adjoining courtyard, and Alvarez said she hopes to plant medicinal plants the friars used in the garden. Another room holds old printing equipment. Alvarez would like to create displays recounting the missionary history of the Franciscans, who were among the first to venture into the Peruvian Amazon, using the museum’s old maps. They also need preservation and restoration work, however, as does a set of choral books. For now, her biggest challenge is finding a way to launch an ambitious project on a shoestring budget.